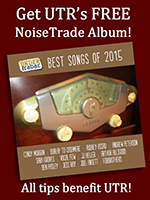 Under the Radar is pleased to announce the release of a new 16-track various artist album called UTR's Best Songs of 2016, available FOR FREE (or free-will tipping) at NoiseTrade.com! This album represents some of the 50+ songs cited by the UTR Critics Panel as the Top Gourmet Songs of 2016. We want to thank all the artists who generously donated their music for this UTR special release. If you feel led to leave a tip, the proceeds will go directly into UTR's non-profit work.